BANGI, 25 June 2012 – The National University of Malaysia (UKM) has been invited to open a branch campus in Tangerang near Jakarta, Indonesia. Speaker of the Kabupaten Tangerang Local Council, Ir. H. Amran Arifin said economy of the district, just 15 kilometres out of Jakarta, is booming and opportunities abound for foreign investors, including educational institutions. He gave an undertaking that the local government will set aside land for the campus if an agreement can be reached by both parties. UKM can also set up an institution for part-time students based on the Open University concept, he told UKM News Portal on Friday. H. Amran had earlier called on UKM Vice-Chancellor, Prof Tan Sri Dato’ Wira Dr Sharifah Hapsah Syed Hasan Shahabudin. He was accompanied by Prof Dr Erman Anom, a UKM Alumni. They discussed bilateral cooperation. Present at the meeting were Director of the Office of International Relations, Prof Dr Imran Ho Abdullah; Director of the Office of Alumni Affairs, Prof Dato’ Dr Laily Din and his new deputy Dr Chang Peng Kee and the Director of the Centre for Corporate Communications, Prof Dr Mohd Safar Hasim. H. Amran said that the Tangerang Council, like all the other local governments in Indonesia, is an autonomous body and thus investors do not need to go through the central government for approvals in investments or in education. Tangerang with a population of 3 million covering an area of some 9,000 sq km is already hosting educational institutions from Germany and China. There are currently 11 universities in the district but demand for higher education in Indonesia outstrips the available places. There is thus a viable opportunity for UKM to set up its branch there, he said. For example there are currently 6,000 teachers in the district who are eager to go for post graduate studies at the Masters level if they can get places in universities, he said. Tangerang’s economy is booming and is already hosting more than 5,000 businesses of all sizes including automotive, hotel and catering and health and wellness industry, H. Amran said. Prof Erman, an Indonesian academic who attended the meeting have a daughter now in his second year at the Faculty of Economics and Management. 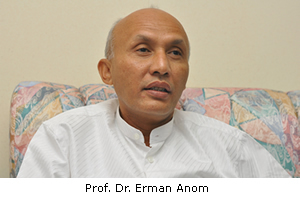 He is no stranger to UKM having entered the university in 2001 at the Faculty of Social Sciences and Humanities. After graduating with a bachelor’s degree, he continued to do his Masters and doctorate at UKM. He advised H. Amran to register his son as an undergraduate at UKM because of the high standard of education at the university. Apart from the quality, there is also the advantage of better motivation for Indonesian students while broadening their horizons in Malaysia. Besides being considered a prestigious university among Indonesian academics its fees and the cost of living in Malaysia is also competitive in relation to Indonesia, Prof Erman said. He advised other Indonesian students at UKM to further their studies to the highest level possible in Malaysia.